When I heard that Michael Laudrup had decided to solve the conundrum of which two wide men to play by playing all three, I was intrigued to see how it would work out but I don't think anyone could have dreamt a first half as fluent, skilful and dynamic as last night against West Brom. There's a fine line between a manager tinkering for the sake of it and one who makes slight adjustments to take account of the opposition. Without wanting to get too carried away, I get the feeling that Laudrup is the perfect combination of romantic and pragmatist. Showing a chalkboard of Swansea's passing yesterday, even for just the first half would be just a mass of lines and hard to take much from. The chalkboard below shows the activity up to the scoring of the 2nd goal and shows the intricate passing down the right ultimately creating space down the left from which the goal scoring passes came from. A lot of the play down the right involved Rangel and comparing the passes received by him and Davies, you can see how although Rangel generally received the ball further forward, Davies was involved in more play around the edge of the box often in tandem with the superb Hernandez. The third goal was a bit more 'direct', not in the sense of a long ball but that the Swansea players cut through the West Brom midfield with relative ease. The second half was probably more nerve-wracking to watch than to play in as it was more the fear of losing a 3 goal lead than any real likelihood that it would happen. Lukaku looked more threatening in the second half but the actual chances West Brom created were minimal (2 attempts in 1st half and 4 in the 2nd). Most passes by some distance was Ki, who was again hugely impressive and it will only be a matter of time before he gets his first goal. 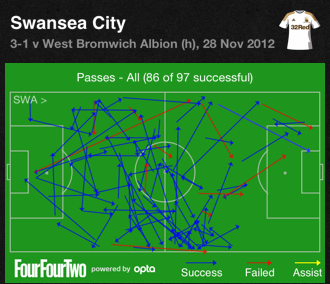 Also of note are the passing stats of Michu who although from far fewer passes had a 100% success rate. It was interesting to see Leon further forward than he is normally and he actually had more successful take-ons than any player (even if it was only 2). Comparing the passes received by Leon and Ki, you can see that the ones received by Leon are generally just off horizontal with those taken by Ki at more of an angle. With Leon, I'd say it takes a hell of a lot of work to make it look that easy. The kind of way Swansea plays only works if all players are comfortable on the ball (to avoid the opposition aggressively pressing to draw the mistake from the 'bad' players). Ki in particular has the ability to quickly change pace, drive in to a space and then offload the ball to keep a move going and with both of them there's little dwelling on the ball just for the sake of it. 20 points from 14 games gives a nice buffer but has also raised expectations. It'd be crazy to expect performances as electric as the first half and as disciplined as the second every match, but it certainly shows what can be achieved with this team.